Niemann pond Saturday morning - glorious! MOTHER NATURE GIVETH, and taketh away. The ice was glorious in Q-Town on Saturday - there was a big hockey game out by Twin Oaks, but I didn't get a chance to check it out. 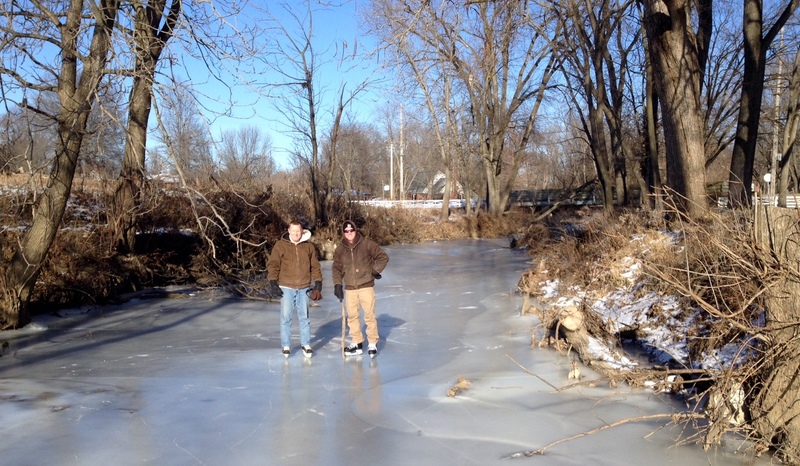 I did, however, get to skate on the Niemann horse farm pond, and then go on a grand adventure down Curtis Creek with two of the outdoors-loving Niemann brothers. Ferd Niemann called me Friday night and said the ice on the farm pond was perfect. He wasn't kidding. It felt great Saturday morning tooling around the ice, but it was probably five years ago since the last time and the rust was still on the wheels, er skates. Geesh. Ten years ago I was chasing around the young guys on that pond and I felt like I could sort of keep up. Not any more. Half an hour of churning around and that was it - I may be older, but at least now I listen when my back and legs say, "Hey Hoser - STOP." Drew and Paul get ready for a grand Curtis Creek skate. Paul Niemann was at the farm and invited me back in the afternoon to skate on Curtis Creek. We were joined by his brother, Drew, and it was one of the coolest things I've done in Quincy. We started by the Curved Creek bridge on 24th Street and headed west. The creek slowly winds north, and it passes by all houses south of Cherry Lane. There were long stretches of good ice, but the day-long sun softened a lot of the ice and our blades would sink an inch or two into the crust. 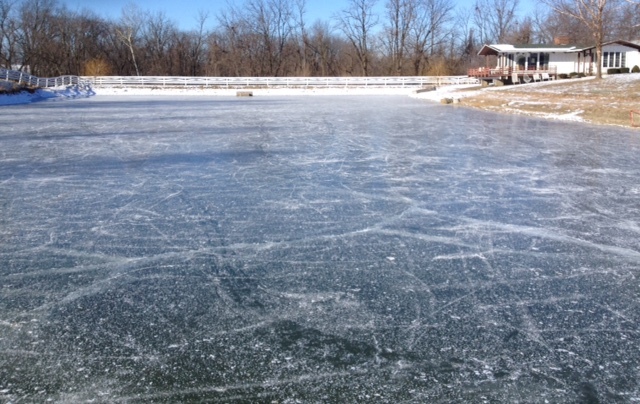 Fortunately there were no major thin spots and the ice was solid most of the way. Making the trek tricky were stretches of exposed rock, where the creek dried up. Drew and Paul said the lack of rain the past few summers has sent the creek level down, so we had to be careful picking our way through a few areas. It kind of reminds you of a lunar landscape, and while it was easy to admire the views, we had to be careful with each stride to not hit a rock or break through the ice where we could see running water. Drew and I got to about 13th Street and we could see the old Richmiller house and where 12th Street goes south of Cherry Lane. This was about 45 minutes into the adventure, and by then Paul was way ahead of us - he ended up in South Park picking up icicles from the waterfall. So we turned around and leisurely headed back. The world in white is a beautiful thing and the air was still, and we actually got warmed up and felt great. Paul, of course, caught back up to us by the time we got back to the farm. The horses greeted us as we strolled back up the hill to the barn and the pond. I briefly thought about taking another spin, but again, the spring chicken in me has long gone. Pain pills (used in moderation) have helped, and it will only take me a week to recover. GUH. Thank you, Niemann family, for letting this poor Canadian once again relive his childhood and feel the cold air in his face, and hear his dull skate blades try to dig into the ice. I'm sad we didn't get a chance to play hockey Sunday - the icy rain screwed those plans up, and it was one of the rare days where the car stayed in the garage and we went nowhere - even the dogs had to do with walks around the block. Now we are hitting 50 degrees and the ice will be gone. Maybe we'll get another cold snap, but probably not. Still, I'll keep the skates handy and you never know if we'll get another chance to zip around the ice.